Edward Snowden in Moscow in 2013. The National Security Agency released an email Thursday from Edward Snowden to its Office of General Counsel, acknowledging for the first time that the former contractor had contacted officials within the agency before leaking information about widespread surveillance activities. Snowden has long maintained that he repeatedly alerted supervisors and NSA authorities regarding his concerns about the domestic and international surveillance programs he had come across in his work as a contractor for the agency, an allegation denied by the NSA in the past. NBC News confirmed the existence of the one email on Wednesday. But the NSA maintained that the one email hardly amounted to Snowden sounding the alarm about surveillance concerns. 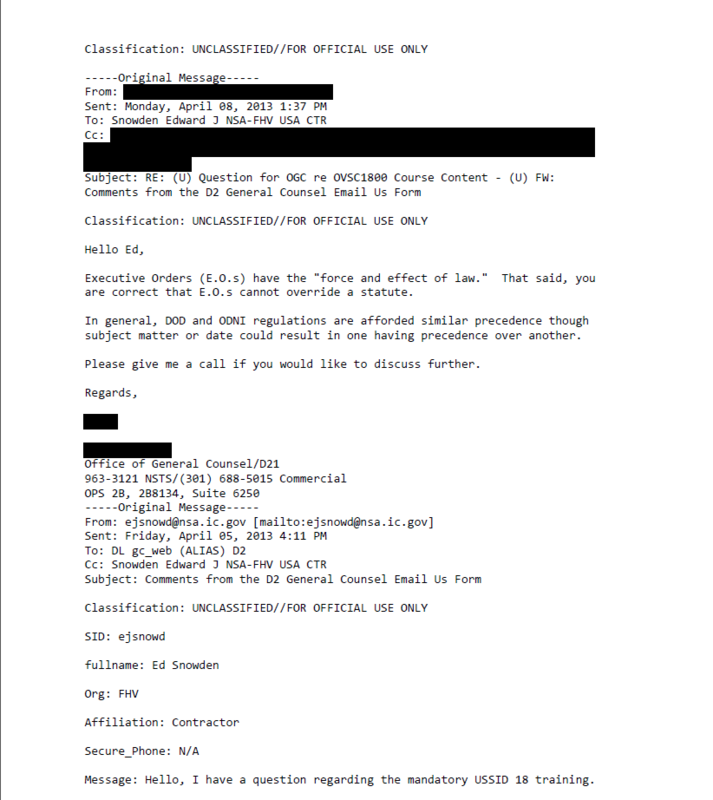 The email, dated April 5, 2013—more than a month before he released a trove of secret documents to reporters but after he had already been in contact with them—shows Snowden asking the agency’s lawyers whether Executive Orders can trump federal statute and whether regulations from the Department of Defense or Office of Director of National Intelligence can take precedence over the other. 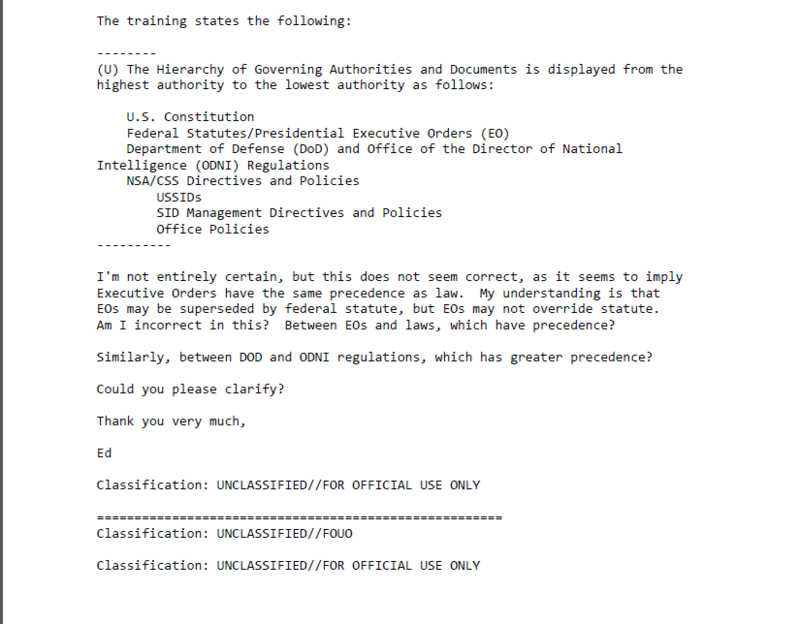 An employee of the general counsel’s office replied to Snowden three days later, answering that executive orders have the force of law but cannot override federal law, and that DOD and ODNI regulations are treated with equal weight. But the email was sent months after his initial contacts with Laura Poitras and Glenn Greenwald when he first showed interest in leaking documents. White House Press Secretary Jay Carney confirmed the planned email release earlier Thursday, saying there were other avenues to raise concerns at Snowden’s disposal, beyond email, that he did not avail himself of. Following on Snowden’s interview with NBC News, Carney said the U.S. government’s position with respect to him has not changed. “Clemency is not on the table,” he said.